Mislabelled v7 #4 instead of v6 #4. Issue not found - may be phantom. 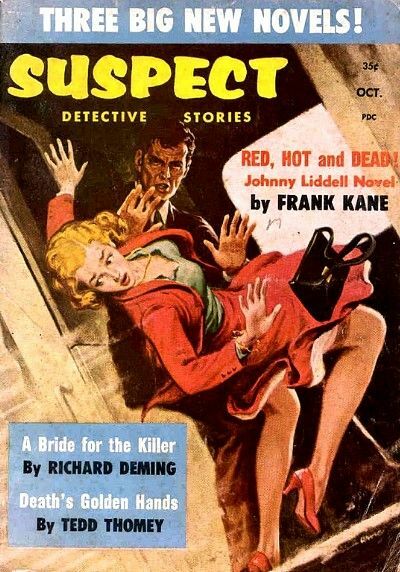 Suspect Detective Stories was a fairly standard crime digest featuring fast-action, contemporary, crime adventure stories. 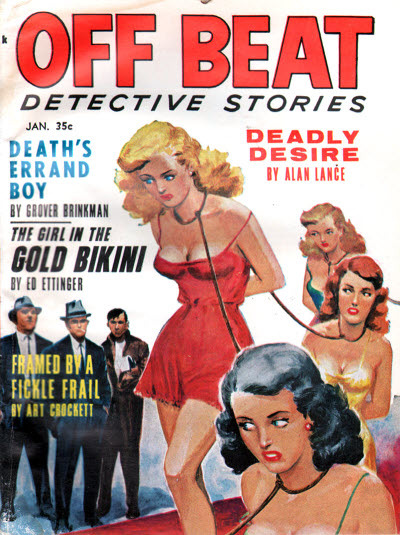 It never made a mark in the crowded marketplace for such fare and folded after 5 issues. The issue numbering was continued by Infinity SF. Details supplied by Jerry McMaster from Table of Contents. 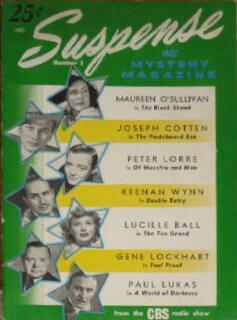 This magazine was based on the Columbia Broadcasting System radio show by the same name. Each issue also contained a preview of the next issue in the form of the first two pages of a story to be published in that issue. Thisll Kill You · Cleve Cartmill · ss [I. A. Findley]; broadcast August 23, 1945, script by I.A. Findley. Portrait Without a Name · Eugene King · ss [Louis Pelletier]; broadcast March 2, 1944, script by Louis Pelletier. Fury and Sound · Roby Wentz · ss [Robert E. Lee; Irving Reis]; broadcast July 26, 1945, script by Robert E. Lee & Irving Reis. The Palmer Method · Michael Corbin · ss [Ernest Martin; Robert L. Richards]; broadcast April 20, 1944, script by Ernest Martin & Robert L. Richards. The Bet · Valerie Kurtz · ss [James Nelson; Donald S. Ryeson]; broadcast November 8, 1945, script by James Nelson & Donald S. Ryeson. The Defense Rests · Mark O. Steele · ss [Rowland Brown; Robert L. Richards]; broadcast March 9, 1944, script by Rowland Brown & Robert L. Richards. No More Alice · Findlay Harrigan · ss [Martin Ryeson]; broadcast March 14, 1946, script by Martin Ryeson. Eve · Roby Wentz · ss [Cornell Woolrich; Robert L. Richards]; broadcast October 19, 1944, script by Robert L. Richards based on The Black Angel by Cornell Woolrich. Sneak Preview · Mark O. Steele · ss [Robert L. Richards]; broadcast March 23, 1944, script by Robert L. Richards. The Kings Birthday · Robert Black · ss [Louis Pelletier]; broadcast August 28, 1943, script by Louis Pelletier. Thieves Fall Out · Cleve Cartmill · ss [Robert L. Richards]; broadcast November 16, 1943, script by Robert L. Richards. This Was a Hero · Lang Miller · ss [Martin Ryeson]; broadcast January 10, 1946, script by Martin Ryeson. Marry for Murder · Carmen Morrison · ss [Walter T. Field]; broadcast September 9, 1943, script by Walter T. Field. Ride to Nowhere · Findlay Harrigan · ss [Robert L. Richards]; broadcast January 6, 1944 as One Way Ride to Nowhere, script by Robert L. Richards. Double Entry · Roby Wentz · ss [Robert Minton]; broadcast December 20, 1945, script by Robert Minton. Fool Proof · George MaGuire · ss [John Shaw]; broadcast November 2, 1943 as Statement of Employee Henry Wilson, script by John Shaw. The Ten Grand · Cleve Cartmill · ss [Virginia Radcliffe]; broadcast June 22, 1944, script by Virginia Radcliffe. The Pasteboard Box · Fred K. Hamm · ss [Joe Grensabach]; broadcast January 17, 1946 as Just a Cardboard Box, script by Joe Grensabach. The Black Shawl · H. J. Jonas · ss [Richard R. Lewis]; broadcast July 27, 1944, script by Richard R. Lewis. Of Maestro and Man · Mark OSteele · ss [Jo Issinger]; broadcast July 20, 1944, script by Jo Issinger. A World of Darkness · Barj Karolian · ss; broadcast January 20, 1944, scriptwriter not identified but may be director William Spier. A Sense of Smell · Roby Wentz · ss [Sylvia Richards]; broadcast September 21, 1944 as The Bluebeard of Belloc, script by Sylvia Richards. Short Order · B. D. Rockford · ss [John F. Suitor]; broadcast August 16, 1945, script by John F. Suitor. 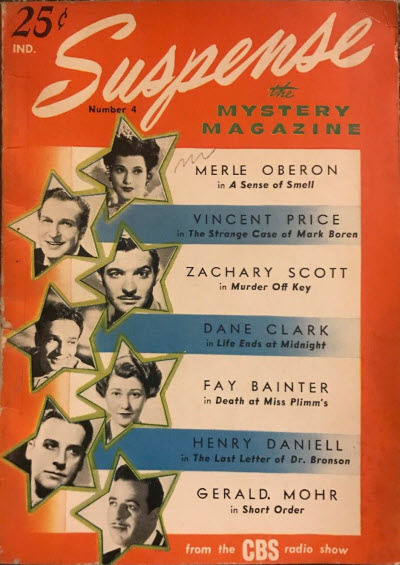 The Last Letter of Dr. Bronson · Cleve Cartmill · ss [Leonard St. Clair; Richard Kreyke]; broadcast July 27, 1943, script by Leonard St. Clair based on story by Richard Kreyke. The Strange Case of Mark Boren · H. P. Lester · ss [E. Jack Neuman]; broadcast November 23, 1943 as The Strange Death of Charles Umberstein, script by E. Jack Neuman. 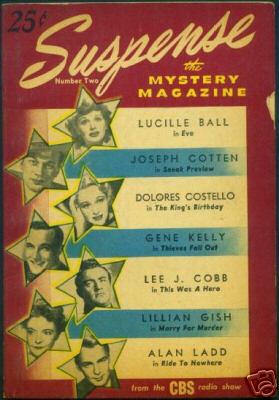 Murder Off Key · Stanley Sprague · ss [Gene Russ Kearn]; broadcast November 15, 1945, script by Gene Russ Kearn. Death at Miss Plimms · Findlay Harrigan · ss [Ruth Vital Nemick]; broadcast February 14, 1946 as The Lucky Lady, script by Ruth Vital Nemick. Life Ends at Midnight · Eugene King · ss [Robert Tallman]; broadcast February 17, 1944, script by Robert Tallman. 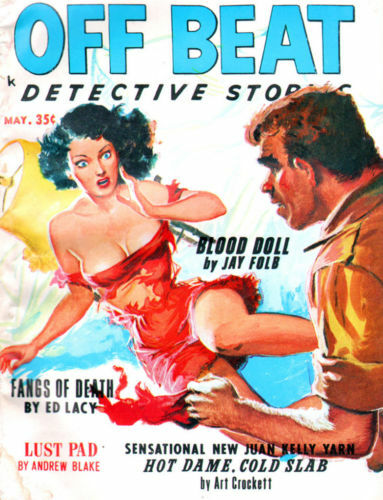 A second attempt to cash in on the popular CBS radio mystery show of the same name, this version also ran for only four issues but included a wider range of material including a lot of science fiction. 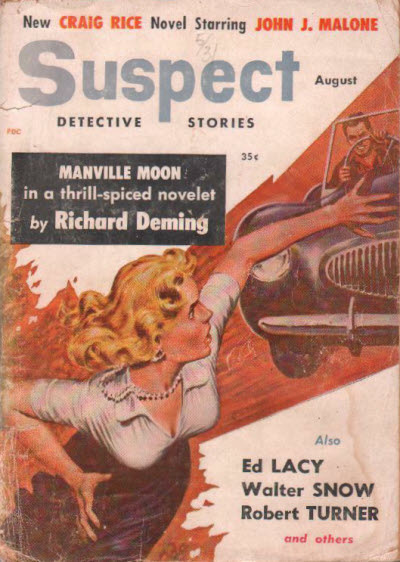 There was a companion series of Suspense Novels that ran for 3 issues in 1951 publishing Strange Pursuit by N.R. DeMexico, The Case of the Lonely Lovers by Will Daemer and Naked Villainy by Carl G. Hodges. 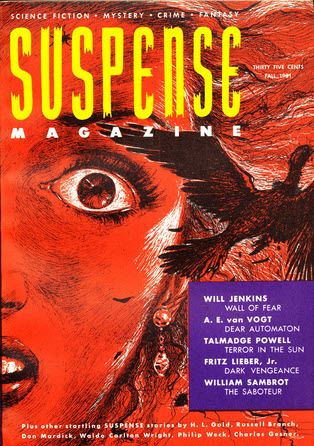 R. B. Williams - Managing Editor: Suspense Magazine, Spr 1951  Fll 1951. 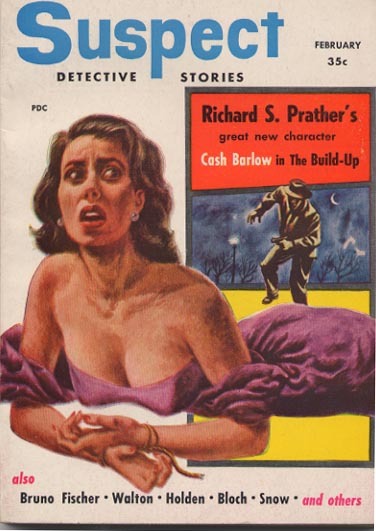 N. R. De Mexico - Associate Editor: Suspense Magazine, Spr 1951  Fll 1951. 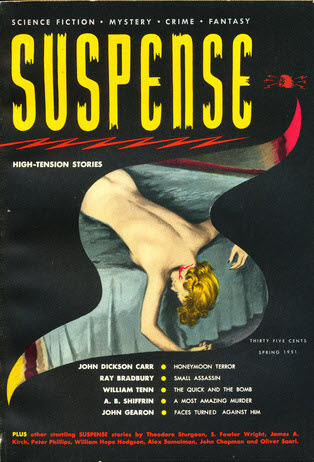 N. R. De Mexico - Managing Editor: Suspense Magazine, Win 1952. 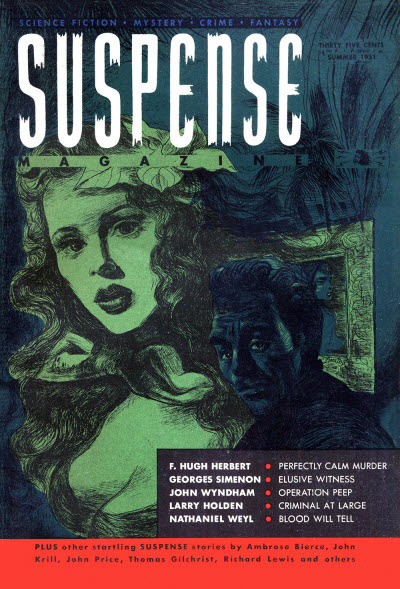 George Stevenson - Associate Editor: Suspense Magazine, Win 1952. 77 · She Didnt Bounce · Peter Phillips · vi; sometimes erroneously attributed to Howard Browne. 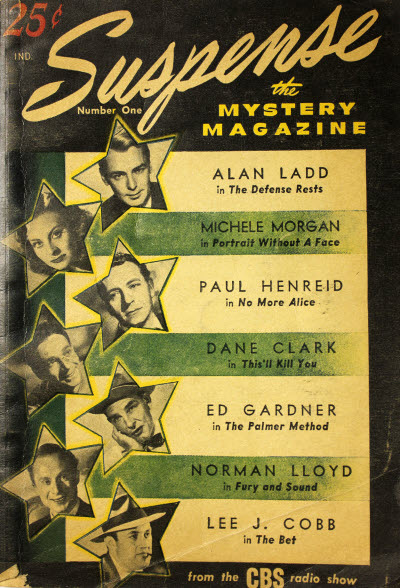 99 · Honeymoon Terror · John Dickson Carr · pl Ellery Queens Mystery Magazine May 1944, as Cabin B-13; first broadcast on Suspense, CBS radio, March 16, 1943. 44 · Elusive Witness [Insp. Jules Maigret] · Georges Simenon · ss; translated from the French (Le Témoignage de lEnfant de Chur, Maigret et lInspecteur Malgracieux, Presses de la Cite, 1947). 98 · Maiden Beware · Richard Lewis · pl; first broadcast July 1944 as The Black Shawl. 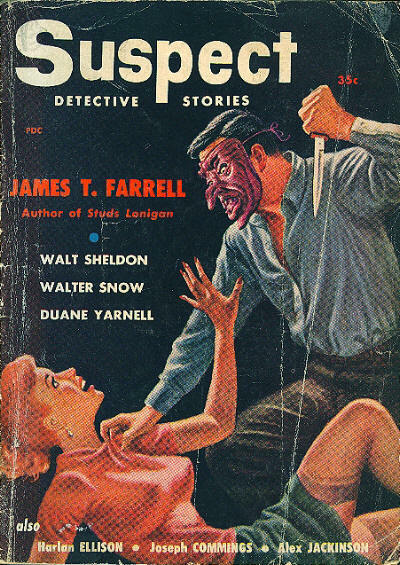 82 · Terror in the Sun · Talmage Powell · ss; given as by Talmadge Powell on the cover. 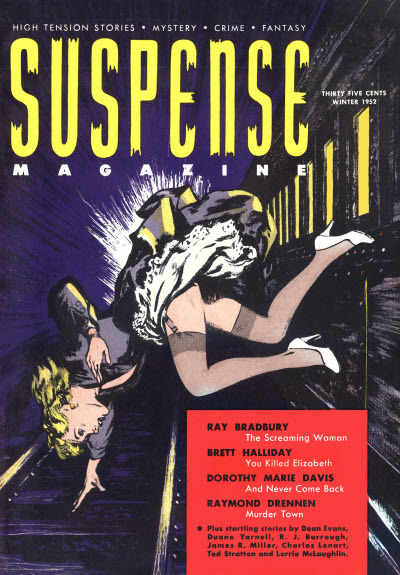 Created as a companion magazine to the British Argosy magazine, Suspense published many original stories by crime writers of the first rank. It lasted for 32 issues before being absorbed into its parent magazine. 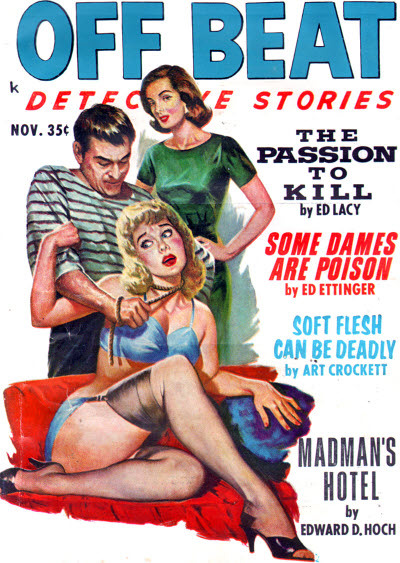 Some of the early issues (at least) were distributed in Australia with identical contents but with covers changed to read English Suspense and to contain an Australian price. 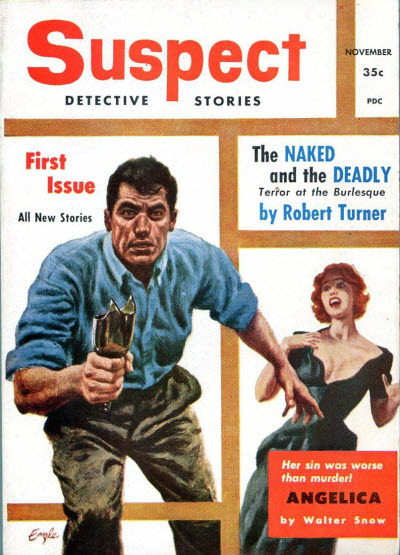 The Amalgamated Press, Ltd.; The Fleetway House, Farringdon Street, London EC4: Suspense (UK), Aug 1958  Jul 1959. 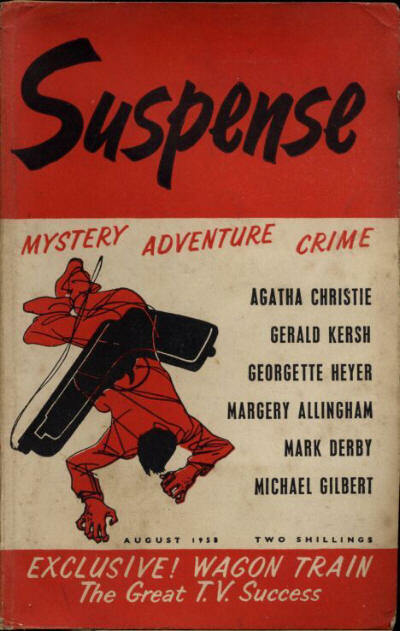 Fleetway Publications, Ltd.; The Fleetway House, Farringdon Street, London EC4: Suspense (UK), Sep 1959  Apr 1961. 132 · Hide My Eyes [Part 1 of 2; Albert Campion] · Margery Allingham · sl Chatto & Windus 1958; abridged.